Retail stocks are on fire this year, but one top technical analyst says it may be time for investors to check out of the group. 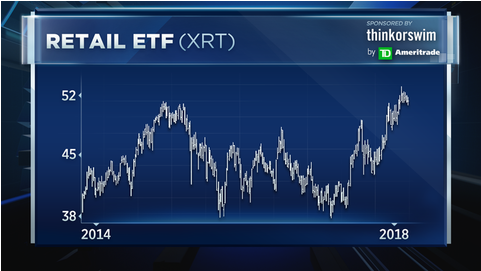 The XRT retail ETF, which tracks the space, has ripped higher this year, up more than 13 percent compared with the S&P 500's 10 percent gain in the same time frame. However, Carter Worth, head of technical analysis at Cornerstone Macro, says something in the charts suggests retail may be heading for a breakdown. 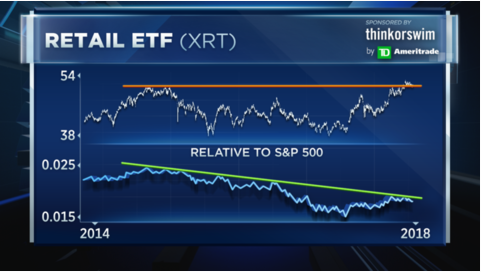 Worth says that despite the XRT hitting an all-time high of $52.50 back in August, the group has pulled back of late and over the past four years has failed to perform relative to the broader market. "What's really important is every single time we've gotten to this downtrend line we have failed. It's not a good setup. I don't like it," he said Friday on CNBC's "Options Action." Retail's impressive gains have put the group on track for its best year since 2013, despite the amassing of multiple consumer-sensitive catalysts, including rising interest rates, oil prices and tariffs. Yet, Worth's charting reveals that the XRT's inability to hold above the $52 level illustrates a bearish double-top pattern and suggests the group is heading back toward its downtrend line, around $50 — or about 2 percent below its current levels. "So I'm betting that that is exactly what's going to happen with the XRT, and if I were in it I would take some profits," he cautioned. Shares of the XRT ETF were trading slightly lower on Monday afternoon, around $51.02.